The players embody archaeologists working for pa- trons. They excavate the land of Egypt to find pre- cious artifacts, which will adorn the most prestigious rooms of the Museum. At the end of the game, the Museum organizes a great exhibition. The player who has earned the most prestige (by discovering things and getting advantageous places in the Museum) wins the game. The board is placed on the table. Multi-colored cubes are placed next to the board. They constitute the general stock. Each player chooses a color, takes the corresponding two marker disks, then places one of these disks on space 0 of the score track 1, and the other one next to the passing scale 4. One player, chosen randomly, starts the game: they take the five 'patron' markers and place them randomly, one by one, in the circular spaces of the five wings of the Museum 3. The game is divided in four seasons. 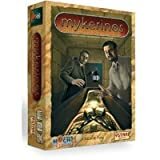 During each season, the players excavate a region of Egypt by placing their men in the various excavation areas of the region. At the end of the season, once the excavating is done, the best ranked archaeologists may either claim a parcel of land or send their men out to prepare the final exhibition at the Museum. Each parcel of land is placed in a patron's tutelage. By claiming a parcel, a player earns the right to appeal to the patron and to use the patron's specific power in the course of subsequent seasons. The Museum is divided in several rooms of varying prestige. The players can book these rooms by sending men into the Museum. They must choose carefully among the different wings, while watching their opponents progress. 35 out of the 36 cards feature a parcel of land on the front, and a patron on the back. The last card also features a parcel, but there is no patron on its back. Parcels are pieces of land on which players can place their cubes to carry out excavations. Each parcel is divided in six spaces that may be empty or contain a pyramid. Spaces containing a pyramid are obstacles; players cannot place cubes on them. What is more, at the center of each parcel, there is a cartouche with information on it. The cartouche indicates the degree of prestige of the parcel: some cards have no figure on them, some have a 2, a 3 or a 5, which represent the prestige points the players will score if they own the parcel. At the center of the cartouche, a sign indicates the patron to whom the parcel is allotted. At the beginning of each round, a new region - composed of parcels - is set up (see fig.1; also see Phase 1). The region is a game board. It is made up of areas (fig .2), which are groups of two parcels. NB: Parcels have no up and no down; they may be placed in either direction. The various areas which make up a region may be separated by a space to make them easier to differentiate. However, areas are considered adjacent. Thus, two spaces which are side-by-side orthogonally (but not diagonally) on two different cards are considered adjacent (fig.3). What is more, cartouches are not considered as obstacles. As a consequence, two spaces separated by a cartouche are considered adjacent. The game is divided into four seasons; each season is divided into three phases. If there are not enough cubes in the general stock, the player can only take what is left. The cubes that were taken from the general stock make up the player's personal stock. Then, the first player builds up the region to be excavated during this season: the player shuffles the pile of cards and sets up the region as shown on the right (parcel sides up). Setting up the region: in seasons 1, 2 and 3, eight parcels are arranged to form four areas (two lines with two areas per line - see the yellow cards on the diagram). In season 4, twelve parcels are arranged to form six areas (three lines with two areas per line - see the yellow cards AND the red cards on the diagram - also see fig.1 above). The player takes a cube from their personal stock and places it on a free space of their choice in the region which is being excavated. It is impossible to place a cube on a space containing a pyramid. Blue starts a new excavation. They can place their cube on spaces A or B (empty spaces), but not on C or D (which already contain cubes), nor on E or F (because of the pyramids). The player takes two cubes from their personal stock. They place the first cube on a free space, horizontally or vertically adjacent to a space already containing one of their cubes. Then the player places the second cube on a free space, horizontally or vertically adjacent to the space where they have just placed the first cube. These cubes cannot be placed on a square containing a pyramid. Red extends one of their existing excavations (space A) by placing a red cube on B, then another one on C.
The player passes. They place their marker disk on the first free space of the passing scale (that is, the space with the smallest number still available). Phase 2 is over for this player. This is the only action available when a player has no cube left in their personal stock. Green passes, by putting a marker disk on the first free space of the passing scale (here, space 1, since Green is the first to pass). This action is available from the second season on, thanks to the parcels the players will get during Phase 3 of the first season (see Phase 3). Thanks to their financial means, the five patrons can help the players with their specific powers. At their turn, the player tilts the card featuring the patron they are interested in. 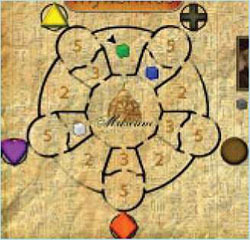 Then, the player acts as indicated (see below). A given player may only tilt one card per turn. A tilted card cannot be used again during the same season, but a player may appeal to the same patron several times in the same season (as long as the player has cards left to tilt, with the patron on them). The player takesa cube their color from the general stock and places it in their personal stock. 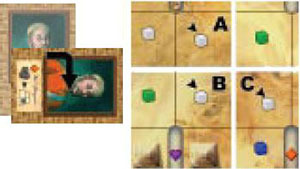 Then, the player carries out action A (start a new excavation) or action B (extend a pre-existing excavation). If the player has no cubes left in the general stock, they cannot carry out this action. 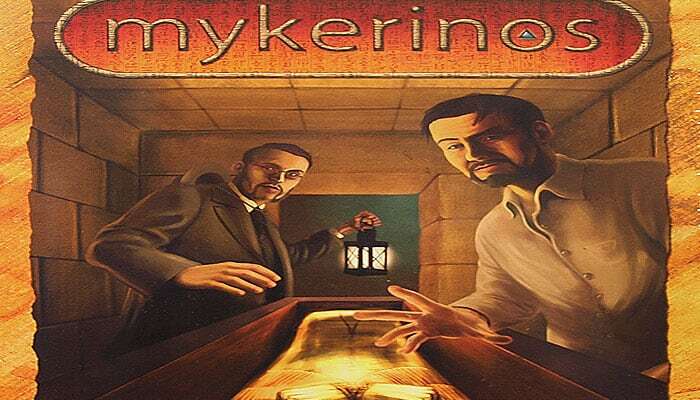 The player may start a new excavation by taking a cube from their personal stock and placing it on a space containing a pyramid (action A), OR extend an existing excavation by placing one of the two cubes of their personal stock on a space containing a pyramid (action B). Blue tilts a card featuring Lord Lemon. Then Blue extends one of his/her own excavations by putting a cube on A (pyramid) and B. 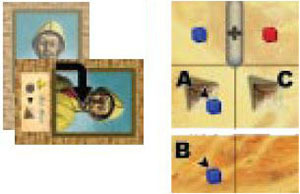 Since A already contains a pyramid, it is impossible for Blue to place his/her second cube on space C.
The player sends one of their men out to reserve a room in the Museum. Instead of playing in the region, they place a cube from their personal stock into the Museum (make sure you follow the Museum placing rules (see Phase 3 - Placing cubes in the Museum). 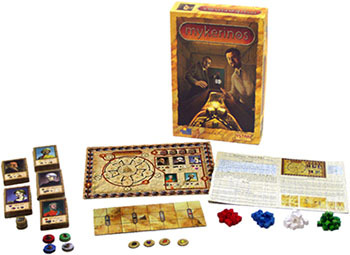 The player may start a new excavation by placing two cubes from their personal stock instead of one. The player puts the first cube on a free space of their choice, and the second cube on a free space, horizontally or verti- cally adjacent to the first cube. These cubes cannot be placed on a space containing a pyramid. Red tilts a card featuring Mrs. Blackmore, and puts one cube on A and the other one on B, which is adjacent to A. 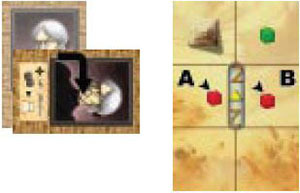 The player may extend an existing excavation by placing three cubes from their personal stock instead of two. The player places the first cube on a free space, horizontally or vertically adjacent to a space already containing a cube their color. Then the player places the second cube on a free space, horizontally or vertically adjacent to the first one, and the third cube on a free space, horizontally or vertically adjacent to the second cube. These cubes cannot be placed on a space containing a pyramid. White tilts a card featuring Colonel Tangerine. 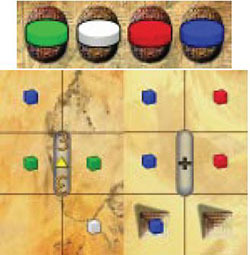 Then, White extends one of his/her excavations by placing three cubes on spaces A, B and C.
When there is only one player left (that is, when the other players have passed), that player may only carry out one action. Then, the game moves on to phase 3. During this phase, the players will claim parcels and book rooms in the Museum for the final exhibition. Count areas one by one, starting with the one in the top left-hand corner of the region. Count line by line, from left to right. In each area, players are ranked according to the total number of cubes they have placed. The player who has the highest number of cubes in the area comes first, the player with the second highest number comes second, and so on. Players who have placed no cubes in the area are not ranked. Areas are counted following the order shown above. f two players or more have placed the same num- ber of cubes in the area, take a look at the passing scale to settle the draw and rank them. In this case, the player who occupies the space with the lowest figure (that is, the player who passed first) wins the draw. Take one of the two parcel cards which make up the area (see claiming a parcel). Book a room in the Museum by placing one of their cubes from the general stock (see Placing cubes in the Museum). This action is impossible if the player has no cubes left in the general stock. Take the remaining parcel card (if the first player has taken the other card) or one of the two parcel cards (if the first player has placed a cube in the Museum). Book a room in the Museum by placing one of their cubes from the general stock. This action is impossible if the player has no cubes left in the general stock. Be careful: in rare instances a player may be alone in an area. In such a case, the player ONLY scores as the first ranked player. If there are cards left once the first and second players have made their choice (that is, if at least one of them has booked a room in the Museum), the player who is ranked third and possibly the one who comes in the fourth posi- tion may take the remaining parcel(s). They may not go to the Museum. Survey of an area: in this area Blue is ranked first with four cubes, Red and Green both have two cubes, and White has one cube. Green passed before Red, so Green occupies a better place on the passing scale, and is consequently ranked second. Red Is ranked third. White comes fourth. Blue must choose between the two cards and the Museum. He/she chooses the leftmost card, which has a value of 3, so Blue moves his/her marker up three spaces along the score track. Then, Blue places the card before him/her with the patron side up. From the next turn on, Blue will be able to activate Lord Lemon's help. Green may choose between the remaining card and the Museum. He/she chooses to place a cube in the Museum (see next example). Being ranked third, Red cannot go to the Museum, so he/she takes the remaining card. Since there is no number on it, Red's score marker does not move. Red places the card before him/her with the patron side up. From the next turn on, Red will be able to activate Mrs. Blackmore's help. Since there are no cards left, White earns nothing. All the cubes are put back into the general stock, and the survey of the next area starts. Finally, discard excess cards in the area (put them back into the box). All the cubes that were played in the area are put back into the general stock. Move on to the next area. The player takes the card. 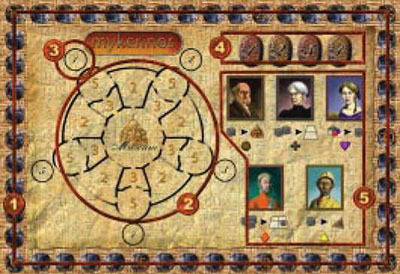 If there are points on the car- touche (2, 3 or 5 points), the player immediately earns the corresponding number of prestige points, and moves the marker accordingly on the score track. Finally, they turn the card patron side up and place it in front of them. The Museum is divided into one central room and five wings. Each wing is composed of two rooms (a room with a '3' value opening onto another room with a '5' value), and is dedicated to the discoveries of a specific patron. In between wings, there are rooms with a 2 value. These rooms belong to the two wings that surround them. They open onto the '5'-valued rooms of these wings. The higher the value of a room is, the more prestige points the room will yield during the final exhibition. Each room may contain no more than one cube. or place it in a '5' room adjacent to a '2' or '3' room they already control. Placing cubes in the Museum: Green places a green cube from the general stock into the Museum. It is Green's first cube in the Museum, so rooms with a '5' value are not available. It is also impossible for Green to put a cube in rooms that are already occupied, so he/she decides to place a cube in the room situated between the wings of Lord Lemon and Mrs. Blackmore. While surveying another area, Green chooses to place another cube in the Museum. Since there already is a green cube between Lord Lemon's and Mrs. Blackmore's wings, both '5'- valued rooms are now available. Green may also choose to put a cube in any unoccupied room with a value of 2 or 3. Finally, Green decides to place a man in Lord Lemon's room '5', which, from now on, is not available to other players. The last player on the passing scale becomes the first player of the next season. The passing scale is emptied. Patron cards that were tilted during phase two are set straight (so, players will be able to use them again in the next season). Players keep the cubes they have not used during this season; they will be able to use them in the next season. 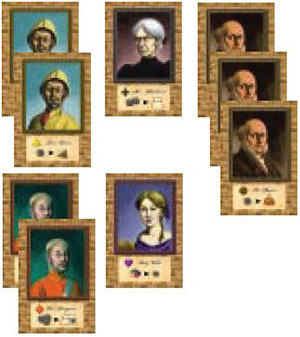 During the exhibition, the players earn points according to the number of cards they own in relation to the places they occupy in the Museum. For example, the place a player occupies in Lord Lem- on's wing will affect the value of the 'Lord Lemon' cards they own. Thus, each card will yield from 1 to 5 prestige points. If the player is in room '5', they earn five prestige points per card they own. If the player is in room '3', they earn three prestige points per card they own. If the player is in a room adjacent to the wing (room '2'), they earn two prestige points per card they own. If the player is neither in any room of the wing, nor in any room adjacent to the wing, they only score one point per card they own. If the player is in several of the above rooms, for each card they own, they earn the number of points correspond- ing to the room with the highest figure. For each series of five different 'patron' cards they own, a player scores five points. The player who has the most prestige points wins the game. In case of draw, the player who has the most cubes in their personal stock wins. If this causes a new draw, the tied players share the win. Note: there is a parcel card (the 5 points card) which is not affiliated to any patron. This card does not yield any museum or series points at the end of the game. One point for his/her 'Lady Violet' card. Series: Blue has a full series of different 'patron' cards. Consequently, Blue score five points.